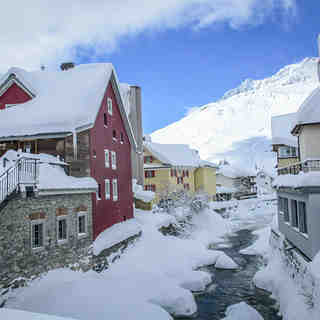 Andermatt is a really cool village. It is very authentic, with old and beautiful buildings. There are plenty of shops in Andermatt alongside the good skiing and snowboard rentals and restaurants. The hotels range from cheap to expensive. Andermatt ski area is fabulous. If you have touring skis, you can have a lot of fun out there. As we where there, the first two days it was snowing hard. We didn't have to go far for "fresh pow". If you go there, don't forget to go through the "Felsental" (rock valley) but only if there is a lot of snow. It's really cool. You'll get to another village, where you can have lunch. A taxi bus will bring you back. The piste skiing at Andermatt is also very nice, with long runs to the village. There is also a controlled unprepared (off-piste) area within the piste area. The top gondola is quite small, and you'll have to wait about half an hour sometimes. Make sure you also go to the two smaller areas (Andermatt is built up in three areas.) 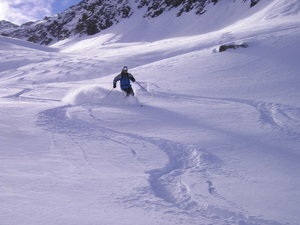 They sometimes provide better sunny conditions and they also offer very nice off-piste skiing. Ski Arena - Andermatt ski center, in the canton of Uri in Central Switzerland is actually develloped in the axis west - east parallely to the train rail, starting from Andermatt (west) and ending to Sedrun (east). From Andermatt up to Dieni you can ski on your own skis. Further away you must take the train. Between Andermatt and Dieni is Oberalp station. I skied in Ski Arena on Saturday, 16th March 2019 and I can say I was not really happy with what the ski center offered to me. The main problem was high temperature, which caused the snow to be soft. I think that the pistes were not well or maybe not at all prepared. All the red pistes had many bumps. In particular, piste no 26 was in awful condition and was even dangerous to ski there. I started skiing from Andermatt, up to Dieni and then returned back to Andermatt. It took me approximately 3 1/2 hours. The itinerary I took were pistes 13, 18, 20, 37, 43 and 47 to Dieni and from there back to Andermatt pistes 49, 39, 36, 26, 27, 3, 2 and 1. As said, the ski center consists mainly of red pistes. None of them seemed to be very difficult because of inclination. The difficulty of all red pistes had to do with bad snow quality and many bumps. The landscape is mainly alpine. There are no trees except in Dieni section. 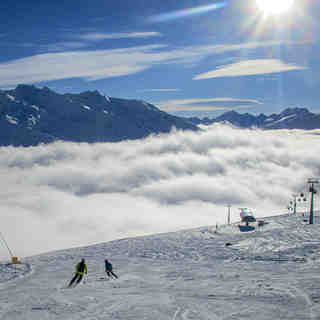 Lift ticket from 12:00 at 67 Swiss Francs and ski equipment rental at the price of 47 Swiss Francs.